There are times of year when currency pairs have up to a 72% directional bias! Would knowing those times improve your forex trading? 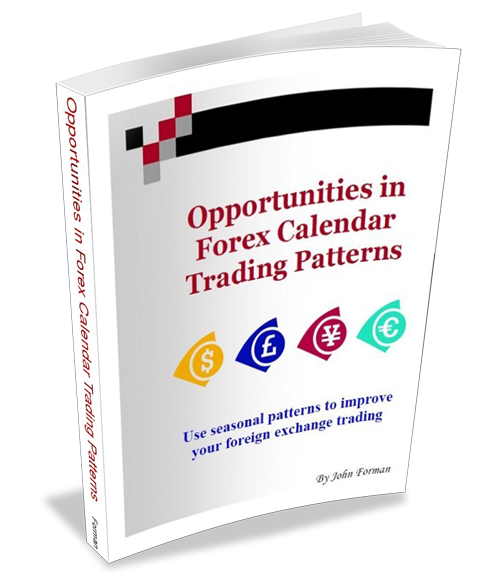 There are calendar forex trading patterns - some very strong ones, in fact. Knowing them could make a huge difference in your trading performance. Find them in this comprehensive research report. "I entered the foreign exchange markets in 1977 and have been involved on and off as both a trader and analyst ever since. In that time I've learnt how important seasonal trends can be, and John Forman provides the most extensive analysis of these trends that I have ever seen." - Gerry Davies, highly respected market analyst and commentator. At just $49 this research could pay for itself in a single trade!